← Of Monsters and Men – My Head Is an Animal: We’re far from home, all alone, but we’re so happy. 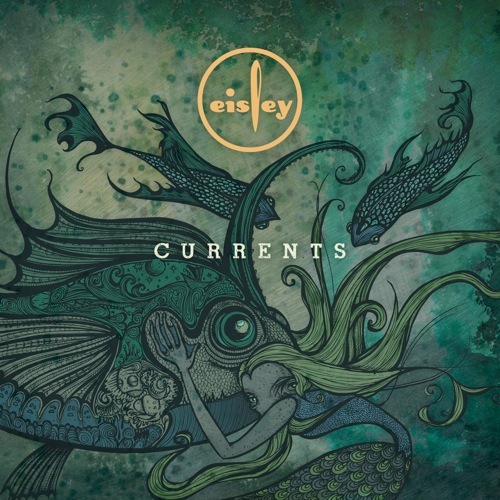 Eisley – Currents: Do you believe in fate, darling? In Brief: This might be the most accomplished album of Eisley’s career. I’ll be playing this one to death just as much as I once did with Room Noises. Eisley‘s debut album Room Noises was one of those rare “perfect pop albums” that I played almost to death back in 2005 when it was new, and for a few years following that as well. The dreamy, imaginative lyrics and the band’s sisterly melodies had me absolutely enchanted. I didn’t particularly care that the band wasn’t the world’s most musically accomplished act, or that they weren’t one of the edgier rock bands out there, or really about any of the other critiques one might have level at the band at the time. I simply related to their songs and found them to be a thoroughly engrossing escape. And I feel pretty much as strongly about that album looking back at it eight years later. In my mind, it’s an indie pop classic. The only problem with it was that as the band released follow-ups in 2007 (Combinations) and 2011 (The Valley), they weren’t nearly as consistent, and I started to wonder if Room Noises had been a fluke. Especially after reviewing The Valley and having a mostly indifferent reaction to the Deep Space EP that followed the next year, I started to get really burned out on the band. Even going back to their early stuff, I felt kind of cheated, as if growing up somehow meant that the band couldn’t work the same magic that they used to. Maybe they felt it important to evolve and make their music more grounded in reality, I figured. Maybe that will speak more to other listeners even if it doesn’t really do it for me. But then something kind of magical happened. Stacy DuPree King, the youngest of the three sisters in the band, got together with her husband Darren King and string arranger/producer Jeremy Larson to form the side project Sucré, which brought back a lot of the melancholy goodness of early Eisley, with a strong shot of romanticized tragedy that played far better than it had on The Valley, and a hefty dose of baroque pop to sweeten the deal. That record was probably too mellow for a lot of Eisley fans, but I felt the same sense of wonder listening to it as I once had with Eisley. I’ve known Larson to be a bit of a musical Midas for a few years now, thanks to his solo work and his contributions to other favorite bands of mine, so I think it was absolutely the right choice for Eisley to bring him on board for their fourth full-length album, Currents. In addition to being a smartly arranged modern pop/rock album, it seems to be one that speaks to the band’s strengths, as it branches off in several imaginative new directions at once, while bringing back the youthful and enchanting persona that the band exhibited so well all those years ago. This isn’t a carbon copy of Room Noises by any means – its songs are often richer in detail, while at times that means that it can take a few listens for the hooks to fully sink in, rather than being shoved right up front. But it’s an album on which every member involved seems to bring their “A” game. Stacy and middle sister Sherri DuPree-Bemis trade off poetic turns of phrase with each other, sometimes sweetly and sometimes aggressively, while lead guitarist and elder sister Chauntelle DuPree-D’agostino makes a stronger showing here than ever before, turning in a few surprising riffs and solos while adding delicious ambiance in a few other places, and finally overcoming her shyness and stepping up to the mic to sing lead on a track for the first time in ages. Brother Weston DuPree continues to show improvement as a drummer, his muscular rhythms doing quite a bit to take their songs beyond the harmless, cute territory you might have assumed they were aiming for, while cousin Garron DuPree backs him up admirably on the bass. No longer throwing out half-hearted attempts to sound like more of a normal rock band, and no longer buried under the angst of label difficulties and Sherri’s divorce from her first husband (which entirely consumed The Valley), Eisley sounds completely reborn here. It’s interesting to note that Currents arrives in the wake of new babies being born to four out of the five band members within the last year or so. You’d expect that sort of thing to leave a band scatterbrained and completely un-focused. But it seems to have revitalized the familial bonds holding the band together, and given them an outlook that embraces the nurturing role of a parent just as much as it embraces the childlike wonder that made me fall in love with Eisley in the first place. Murky, subterranean sounds and stuttering piano make for just about the oddest intro to an Eisley song (and album as well – all three of their previous ones began immediately with vocals). But once Weston’s drum groove kicks in, it all starts to make sense. It ultimately ends up being more of a guitar-driven song, with the watery distortion on Chauntelle’s lead guitar sounding like she’s been listening to a bit of Beach House, while Sherri’s rhythm guitar gets more nervous and angular, reminding me of some of my favorite Mew songs. It’s an unusual combination for Eisley, but it mixes well with the ladies’ sincere harmonies as they sing of parting waters and shifting currents to help a loved one navigate troubled waters, punctuating it with this question in the chorus: “Do you believe in fate, darling? Ask me, ask me.” This may not be as heavy a song as “Many Funerals” or some of The Valley‘s angrier moments, but if you thought all Eisley did was harmless twee pop, you might be in for a surprise at all of the moods and textures they’ve discovered here. When your band is know mostly for its catchy pop songs, it takes courage to put one of your most experimental songs so close to the front of an album. That happens here, with what sounds like a bit of a train-of-thought exercise, not adhering to any expectations of traditional song structure. Stacy’s upward-spiraling piano melody seems to have been the catalyst for this one, as the rest of the band gradually swirls about her in an increasingly busy whirlpool of sound, which is beautiful one moment due to the sisters’ breathy vocals running up and down the scale, and intense at the next due to Chauntelle and Weston letting loose on the guitars and drums. The lyrics up until that point are very abstract – I couldn’t tell you what “Bait me like blue fish” means or why the song eventually settles into the repetitive mantra “We all fall down”. But it never seems all that repetitive, or at all tiresome, when I’m in the midst of it. Imagine the desperation felt at the emotional climax of “Memories”, multiply that by a few degrees, take out the familiar verse/chorus setup, and that’s the strange but compelling result that you’ll get here. The album’s first single is noticeably more straightforward, but actually a bit twisted if you look beneath its surface. At first, you’ll hear a straightforward rhythm, the light tinkling of a repeated piano motif and a compelling vocal hook inviting a little boy for a refreshing drink of water… except what’s that chorus lyric? “Drink the water from the mud, little boy?” That doesn’t sound very motherly. Stacy’s references to the child as “Little wicked boy” and “Little impish one” give the song a sinister nature, despite her assurance that “I love you, I can save you if you believe.” It’s like being lured away by some false specter of a nurturing parent. I somehow doubt that this is about any of the band members’ own experiences with parenthood, but perhaps it’s a subtle jab at someone who was supposed to have loved and led them when they were younger, only to poison them with an overly cynical view of the outside world. “Tell me that you don’t belong, little boy.” What kid wants to hear an adult who he looks up to say that? Pretty interesting song here, only slightly weakened by how its bridge section just sort of trails off and never comes back to the chorus. That worked OK in “Blue Fish” due to the lack of structure in general, but here, I sort of feel left hanging. I said in my review of The Valley that edgy rock songs weren’t really Eisley’s forte. That wasn’t entirely fair – they have a few that I really enjoy. But this one blows any previous attempt out of the water. It manages to do so without kicking the sweet vocal harmonies to the curb – you think you’re in for a bit of gooey pop goodness when the other girls gorgeously coo behind Sherri, as she sings of a memory from her childhood, a precious five-year-old all dressed up for some special occasion. But then you notice how strong Garron’s bass line is, how it’s been shoved up to the front of the mix, and as soon as it dawns on you that they’re building up momentum, they launch into a feisty, fast-paced chorus that easily ranks among their all-time best. I can’t get the song out of my head – it plays like an angry takedown of a spiteful person who gave a young girl false hope, only to abandon or betray her in the end. The bridge here is downright spine-tingling, with its sudden shift in rhythm echoing the offbeat pace of “Many Funerals”, while the three sisters all ganging up on the listener with their chilling harmonies bring to mind the bridge of “A Sight to Behold”. It was sweet in that song, but here it’s tragic: “Rising from the ashes/Waking all the dead/Tearing through the sadness/Ringing through my head.” Man, imagine if The Valley had been made up of songs like this one. I certainly would have had far more nice things to say about it. Right after the album’s most intense up-tempo song, we get a relaxed, acoustic piece that brings Chauntelle’s voice to the forefront. For long-time Eisley fans, this is a big deal – there’s a rare song from their indie days that she sang on, but that the group sort of disowned because she didn’t like the outcome. And in concert, she’s typically shied away from the mic despite how often you can spot her mouthing the words to the songs her sisters are singing. Other than the bridge of “I Could Be There For You”, she’s only ever sung backup on the group’s official albums until now. While her voice doesn’t have the same force or volume as her sisters, there’s a mellower vibe to it that fits a song like this perfectly, and there’s a lush, pastoral sort of quality to her finger-picking that reminds me of one of my early favorites by the band, “Just Like We Do”. One might get so caught up in this beautiful turn of events that it would be easy to miss the strong shades of regret and uncertainty in the lyrics. Not knowing the future, and not being able to undo past mistakes that she fears may have taken their toll on someone she cares about, are concerns that weight on Chauntelle throughout this song. The title is never references in the song, but it’s interesting to me all the same – if taken as a subtle Biblical reference, then it ties into the album’s aquatic theme in a rather eerie way. But you’ll probably forget about all that when you reach the end of the song, with its angelic “ooooh”s from all three sisters gradually fading away. Speaking of things being weighed down, this is the one song that I feel causes Currents to suffer just a little bit. I can’t say anything all that bad about it – it just seems to stumble through Eisley’s usual tropes in ways that sound like the band has done them all better before. You can’t blame Stacey for coming up with a heartfelt, confessional lyric about a man she’s a complete wreck without, the bond between them helping her navigate the storms of this big, nasty, grown-up world we’ve all been told exists out there somewhere. In a way, I have to admire that an Eisley song is trying to acknowledge the difference between their colorful fantasy world and reality head-on (though this isn’t the first time they’ve done that – maybe part of my problem here is that it’s a little too “on the nose”). The tempo of the song seems to stutter a bit, as if it’s not entirely sure whether it wants to be a pop song or a ballad, and despite Stacey’s lovely vocals and a solid performance from the entire band, this one feels like a never-ending pre-chorus in search of a chorus. It just doesn’t have a strong enough melody, or at least not one that sticks to its rhythm firmly enough, to really stand out to me. It’s not as generic as the last few tracks on The Valley, but showing up on such a high-quality album, it almost feels like it should have been a B-side. The album’s most intimate song could have easily been recorded by Sucré last year – its focus on an acoustic guitar, a gentle string arrangement, and Stacey’s fragile, lovelorn vocal performance would have fit in perfectly. As with “Millstone” contributions from the rest of the band are more subtle here – Sherri is most notable just because she and Stacey are trading off vocal sighs with the strings at a few points during the chorus. And I love to hear those two play off of each other (they’ve done it so well for so long that I may not even be correctly identifying who sings what at times). In true Eisley fashion, this isn’t quite a typical love song, because the woman calling out to her lover has been long since dead and buried, and now she’s one with the landscape itself: “I’m a watchtower in the morning/Waiting for the sun to rise/I’ve got riverbeds in my eyes/I’m a bonfire on a hillside.” But it doesn’t play as creepy – her yearning is genuine, as if the two could still share a special moment just with him kneeling at her graveside and her spirit listening, floating on the wind or perched on a tree branch nearby. The maternal side of the band comes out more genuinely on this track, with its bounding, syncopated rhythm and its fiercely devotional lyrics, dedicated to a child who has saved the life of his or her own mother. Sherri longs to return the favor, making increasingly fanciful promises: “Child, I will see you through a murderous comet/A sly little comment/Oh Buttercup, I will see you through a thousand bold soldiers/With guns on their shoulders.” These sorts of exaggerations are the best way she knows to communicate unconditional, boundless love, and it leads to a song that is interesting in fragments, but that falls victim once again to the typical Eisley tropes when we get the chorus, which is literally comprised of only the words “Hey”, “La”, and “Oh”. These are all words that Eisley’s stretched out and abused in beautiful ways to arrive at memorable choruses before (and some not-so-memorable ones… see “Ambulance”, for starters). But the effect wears a bit thin here, despite how hard the earnest vocals work to sell it. The result is a merely “good” song that could have been better – I suppose that puts it in the same company as “My Lovely”, in terms of it being a low point only because the rest of the album is of such high quality. With that said, my attention does perk up again when Chauntelle gets a nice little guitar solo in during the bridge. This one seems to be competing with “Plenty of Paper” in the bizarro department. It might just be because both songs are track 10 on their respective albums, and both have addictive, syncopated rhythms to them that make me picture colorful cartoon trains zig-zagging their way through an ancient forest (and who else is this band’s target audience, if not folks with overactive imaginations?) But man, I’m scratching my head more than ever trying to unravel what’s going on within the gears of this song. It’s got another chorus that seems deceptively simple on the face of it – “If I can see the light in your eyes/Then I won’t die, then I won’t die” – but which makes me wonder all over again what Eisley’s relationship is to the world of “Christian music” that they seem to be tangentially adjacent to, but never quite part of. Passing references to “scared machines”, a child needing to “break into the outer world”, repeated cries of “wake up”, and the truly baffling line “I heard that you are a dancing crew who had saved the world in thirty-three” could mean a lot of different things – I can come to no conclusions other than a songwriter being in the process of trying to reconcile long-held beliefs with a subculture whose idioms and customs no longer make sense to her. As with all things Eisley, it’s open-ended. Oh, and speaking of solos, Stacey’s keyboards get a good one here. I’m conflicted about this one – it seems to have been cited as a highlight by other listeners, and it certainly catches me off-guard when its loose, detached acoustic strum switches to a much more rigid, driving rock rhythm for the chorus and then back again. Musically, it knows how to walk the line between quiet contemplation and symphonic drama – Larson’s contribution on the strings helps to ensure the “drama” side of that equation once again, creating a tense atmosphere throughout. But Sherri’s lyrics are frustratingly vague here, and not in the image-heavy, abstract sort of way that they usually are. It could very well be another song about motherhood – that’s hinted at when she promises to shine light on someone who is sleeping and keep watch through the night. But then there’s a hint of rebellion coming from this person or group that she cares so much for, leading to a chorus that doesn’t seem to fit any of my interpretations: “Because I’m, I’m better than this/And you all, you couldn’t resist/And that’s okay, because I love you all/I love you all, I love you the most.” There’s some serious subject confusion here – I don’t know what she’s better than, or what “you all” couldn’t resist. And I’m OK with not fully understanding a song – but not even being able to get at the basic premise of a song’s chorus tends to keep me at a distance from whatever story it’s trying to tell. I feel like some lyrics might have gotten dropped here that could have made those connections a bit more apparent. Still, the band’s command of mood and texture here is commendable. That does a great deal to help salvage a song that lags a bit in the lyrics department. The album ends strongly and sweetly – actually, this might be the best note Eisley’s ever ended an album on. (Let’s see… “Trolley Wood” is fun, but a bit simplistic, “If You’re Wondering” is a cute little lullaby, but feels redundant following Combinations‘ title track, and “Ambulance” is neither an appropriate finale nor a good song in general. So yeah.) This was where I first noticed Larson’s influence the strongest, as a very straightforward romantic ballad is held up almost entirely by his strings and Stacey’s piano. It definitely falls into the “simple summation” category as far as album closers go, but it’s chorus of “Love, love you are my shelter” fits perfectly in context after all of the songs about protection and guidance and/or the lack thereof that have preceded it. Once again, the band flirts with spiritual implications, but doesn’t quite state them outright, hinting that this “shelter” is not a permanent residence, but a safe harbor on the way to one’s eternal home. They might edge a bit closer to the saccharine than their usual, but the smart arrangement and another tight vocal performance keep that from being too much of an issue. I don’t mind a mellow pop song being unapologetically sweet, if it can also be decadent in the process.